Purpose: This study sought to describe features of the physical space in which practices integrating primary care and behavioral health care work and to identify the arrangements that enable integration of care. Methods: We conducted an observational study of 19 diverse practices located across the United States. Practice-level data included field notes from 2–4-day site visits, transcripts from semistructured interviews with clinicians and clinical staff, online implementation diary posts, and facility photographs. A multidisciplinary team used a 4-stage, systematic approach to analyze data and identify how physical layout enabled the work of integrated care teams. 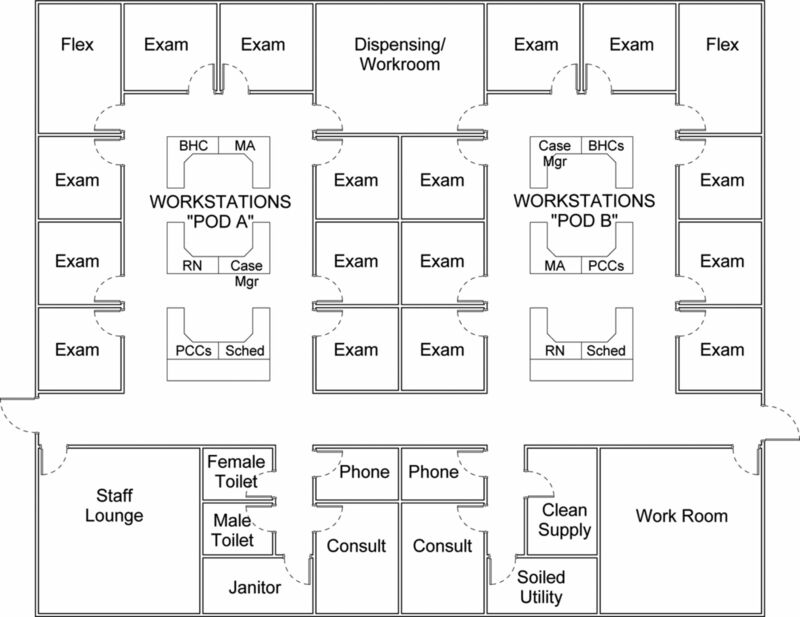 Results: Two dominant spatial layouts emerged across practices: type-1 layouts were characterized by having primary care clinicians (PCCs) and behavioral health clinicians (BHCs) located in separate work areas, and type-2 layouts had BHCs and PCCs sharing work space. We describe these layouts and the influence they have on situational awareness, interprofessional “bumpability,” and opportunities for on-the-fly communication. We observed BHCs and PCCs engaging in more face-to-face methods for coordinating integrated care for patients in type 2 layouts (41.5% of observed encounters vs 11.7%; P < .05). We show that practices needed to strike a balance between professional proximity and private work areas to accomplish job tasks. Private workspace was needed for focused work, to see patients, and for consults between clinicians and clinical staff. We describe the ways practices modified and built new space and provide 2 recommended layouts for practices integrating care based on study findings. Conclusion: Physical layout and positioning of professionals' workspace is an important consideration in practices implementing integrated care. Clinicians, researchers, and health-care administrators are encouraged to consider the role of professional proximity and private working space when creating new facilities or redesigning existing space to foster delivery of integrated behavioral health and primary care. Therefore, the purpose of this study was to describe the observed spatial designs in 19 diverse practices integrating primary care and behavioral health and to identify how physical space and clinician proximity was connected to the behaviors of PCCs and BHCs working on these teams. Based on this analysis, we offer design recommendations that can inform practices as they develop and adapt their settings to deliver integrated care. This was an observational study that used qualitative data to draw comparisons between 19 diverse practice sites. The Institutional Review Boards at Oregon Health & Science University and the University of Texas approved this study. Interviews were audio recorded and professionally transcribed. Transcripts were checked for accuracy. During the site visit, the research team took notes or jottings that were written up within 24 hours as detailed field notes. Photographs, diary posts, field notes, and interview transcripts were deidentified and entered into Atlas.ti (Version 7.0, Atlas.ti Scientific Software Development, GmbH) for data management and analysis. A multi-disciplinary team composed of an anthropologist, social and clinical psychologists, communication scientist, public health specialist, primary care physicians, and architect analyzed data in 4 steps. First, we examined the photographs from each practice while reading field notes and interview data. This allowed us to develop an understanding of each practice and to get a sense of the physical layout of the practice and how clinical teams used these spaces to deliver integrated care. Second, we examined findings across practices to identify common patterns regarding the use of physical space. Through this process we identified 2 common practice layouts based on BHC and PCC proximity. Within each of these layouts, we examined how integrated-care team members worked together in the space to deliver care, making comparisons between the 2 layouts we identified. We felt that it might be useful to express what we were observing in our qualitative findings numerically, and our third step was to count the times we observed PCCs and BHCs working together face to face to coordinate and integrate care for patients. We used a Z-test to compare whether the proportion of patient encounters in which BHCs and PCCs were observed coordinating care differed significantly between the 2 different practice layouts. Fourth, we shared preliminary findings from this analysis with an architect specializing in health care design, who provided additional insights into the design features we were observing, helped identify design strategies that could be employed by practices who were remodeling or building new space to deliver integrated care, and drafted figures for 2 floor plans that might support integrated care teams based on our observations. Practices varied in size, ownership, location, and integration approach.12,13 Three practices built new facilities with plans for delivering integrated care. Three practices remodeled their facilities and 5 repurposed existing space to accommodate new professionals (eg, shifting office locations so that clinicians from different backgrounds were in close proximity; placing BHCs and PCCs in the same office). Table 1 summarizes practice characteristics, the layout of each practice, and characteristics of practices' approach to integration. Observed type 1 layout: primary care and behavioral health clinicians located in separate work areas. Observed type 2 layout: primary care and behavioral health clinicians located in shared work areas. Although shared offices ranged in size, they included professional workspaces (eg, desk, computer) arranged in close proximity, so team members worked shoulder to shoulder. Shared offices had open space designs that afforded little privacy but facilitated opportunity for cross talk among professionals. Other team members, such as medical assistants, nurses, or pharmacists, could be located in the same office, depending on size and availability of space, or in workspaces nearby. We observed 2 key dimensions of physical layout that were in tension and needed to be balanced in practices working to integrate care: the proximity of BHCs and PCCs and the presence of workspace that enabled professionals to perform job duties that required privacy. We show how different ways of working together to coordinate patient care emerged in these differing spatial arrangements. Although various strategies were employed across practices to bridge the distance between professionals, such as the use of cell phones, radios, and instant messaging in the electronic health record (EHR), key informants noted that these workarounds were no substitute for locating staff in close physical proximity. The frequency in which we visibly observed BHCs and PCCs coordinating patient care (ie, 2 professionals working in a parallel or back-and-forth fashion to achieve a common patient care goal while delivering care)16 varied significantly across the 2 layout types. BHCs and PCCs coordinated care in 41.5% (n = 39) of the total observed patient encounters in practices with shared work areas (type-2 layout) compared with 11.7% (n = 14) of the total observed visits in practices with BHCs and PCCs in separate spaces (type-1 layout, P < .05). Although Practice 3 did not have problems with privacy as it related to patient encounters, they reported problems trying to accomplish focused work in the common, open office space. Other practices reported similar challenges. To address this challenge, practices might have rooms available for additional medical examination purposes, consults, and therapy, and for work that needed quiet and privacy. This allowed practices to balance the need for individual and team work space and ameliorate professionals' feelings of overexposure by the increased visibility of their work. A strategy used by other BHCs was to carry their laptops with them in the hallway to be positioned in the midst of practice workflow (Practice 2). Other practices overcame distance between office locations by having BHCs and PCCs “hang out” in shared workspace, such as around the medical assistants' work stations. Whether building new facilities or remodeling, we used study findings to work with an architect specializing in designing health care space to design 2 layouts practice leaders might consider using when integrating physical and behavioral care teams. 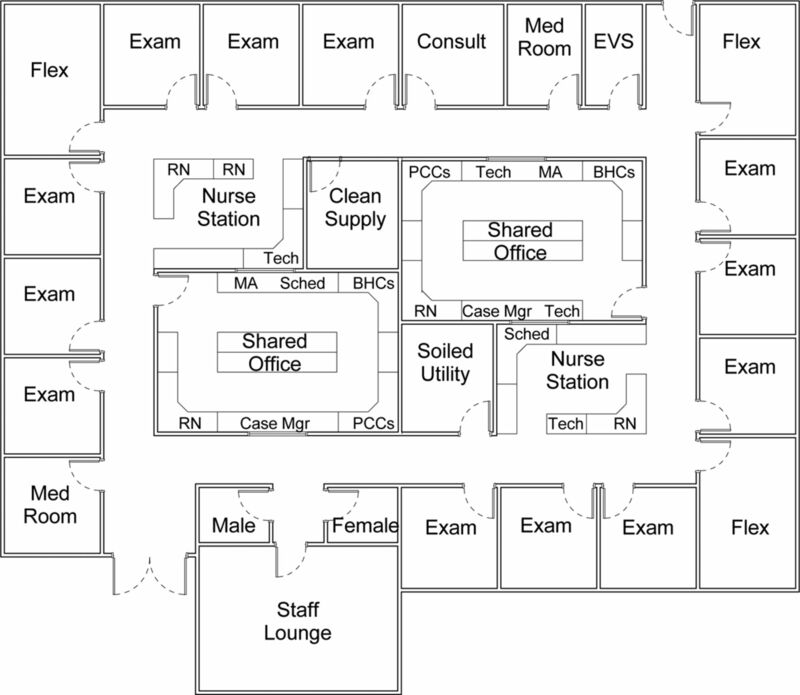 Figure 3 is an example floor plan that incorporates a central pod arrangement that allows for members of a care team to sit in close proximity to one another in an open space. Flexible rooms are available for quiet work, private consultations, individual or group counseling, and overflow examination space. The design depicted in Figure 3 could be beneficial for practices with smaller rooms, who might be able to make some modifications to an existing medical assistant station and add clinicians and other care team members to that space. Figure 4 differs in that team members share a central shared workspace in a closed office. This arrangement allows for more privacy among the staff and providers, but diminishes the visibility and “bumpability” among clinicians and support staff that is afforded by the design depicted in Figure 3. Figure 4 could be beneficial for practices with larger rooms that can be used to accommodate an entire care team. Recommended floor plan example, open pod arrangement. BHC, behavioral health clinician; Case Mgr, case manager; MA, medical assistant; PCC, primary care clinician; RN, registered nurse; Sched, Scheduler. Recommended floor plan example, closed pod arrangement. BHC, behavioral health clinician; Case Mgr, case manager; EVS, environmental services; MA, medical assistant; PCC, primary care clinician; RN, registered nurse; Sched, Scheduler. We assessed spatial designs and behaviors among professionals delivering integrated care in 19 practices located across the United States. 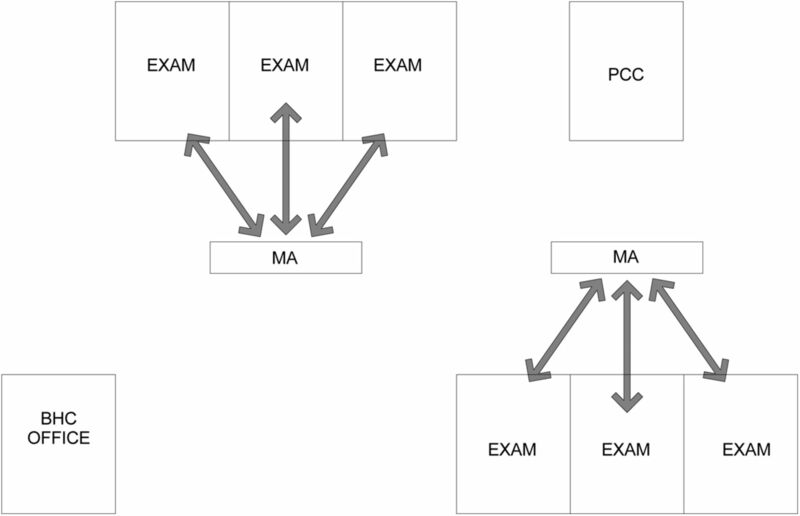 Two spatial layouts emerged from our analysis, and were distinguished by the amount of separation between PCCs and BHCs. Close proximity of BHCs and PCCs promoted situational awareness, “bumpability,” and on-the-fly communication among professionals. In addition, clinicians working in closer proximity engaged in significantly more face-to-face interactions to coordinating patient care than clinicians separated by distance. Our findings show that when designing or reconfiguring space for delivery of integrated care, practices must strike a balance between professional proximity and adequate private working space, given that private space was need for focused work and consults with patients or clinical team members. Many practices that aspire to provide integrated care do not have the luxury of creating new facilities; they have to make do with available space. Renovations can be costly, and the expenditures needed to renovate or build new space can be a large part of start-up expenses when transitioning to an integrated approach.21 Although practices may struggle with a space that does not fully accommodate the new needs an integrated team, our findings show how these challenges can be ameliorated by a number of lower-cost strategies, including arranging more compact work areas that allow clinicians easy access to one another and close proximity of patient rooms to team workspace; and designating or repurposing flexible spaces outside of clinical examination rooms and workstations to provide for examination room overflow, quiet focused work, and private provider consultations. There are a few important limitations in this work. First, much of the qualitative data we analyzed came from observations and interviews during site visits. Data reflect what was happening in the practice during these time periods and could be influenced by factors such as clinical team member absences. Second, we were unable to observe 2 of the practices first hand; we relied on other data sources (ie, online implementation diaries, interviews) to understand how space was used in these practices. We did not, therefore, include these practices in our counts of coordination. Third, what is observed during site visits can be shaped by the preconceptions of research team members. We mitigated this bias by having multiple team members collect and analyze study data, and by triangulating multiple data sources.22,23 Finally, our counts of coordinating behaviors were based on what we could see professionals doing (ie, working together face to face) and may not fully capture very subtle and less-visible mechanisms for coordinating delivery of integrated care, such as via an EHR. Results of the statistical comparison suggest that examining the relationships between space arrangements and interprofessional behaviors (eg, coordination) as well as other outcomes (eg, care quality, patient experience) may be worth additional study. Physical space can constrain or foster the integration of primary care and behavioral health services for patients. Clinical workflows and technologies, such as walkie-talkies or other communication devices, cannot entirely bridge spatial divides. Health care organizations committed to integrating care must adapt their current spatial arrangements or create new facility designs that support integration. In this study, a variety of enabling design features were utilized by a diverse range of practices working to integrate their primary and behavioral health care. Data from these integrated care environments provide practical information that clinicians, researchers, and health care administrators can use to design clinical spaces for integrated care that meets the needs of real-world clinics across the country. The authors are grateful to the participating practices and their patients. The authors thank Leah Baruch, MD for her assistance with data collection on the IWS study and David Cameron, BA for his assistance with data analysis. The authors thank Bijal Balasubramanian, MBBS, PhD; Larry Green, MD; Frank deGruy III, MD; Sheldon Levy, PsyD; and Maribel Cifuentes, RN, BSN for providing helpful comments during the preparation of this manuscript. Funding: This work is funded by grants from The Colorado Health Foundation (CHF-3848), Agency for Healthcare Research and Quality (8846.01-S01), Tides Foundation/CalMHSA Integrated Behavioral Health Project (AWD-131237), and Maine Health Access Foundation (2012FI-0009). MD's time is partially supported by an Agency for Healthcare Research & Quality–funded PCOR K12 award (Award No. 1 K12 HS022981 01). Received for publication February 8, 2015. Revision received May 15, 2015.
. Impact of office layout on communication in a science-driven business. R&D Management 2008;38:372–91.
. The Social Logic of Space. Cambridge: Cambridge University Press. 1984.
. Promising practices in safety-net clinic design: An overview. California HealthCare Foundation, 2011.
. Traditional versus open office design: A longitudinal field study. Environment and behavior. 2002 2002;34:279–99.
. Exploring the impact of the physical environment on patient outcomes in ambulatory care settings. HERD 2009;2:21–41.
. Designing safety-net clinics for innovative care delivery models. California HealthCare Foundation, 2011.
. Design research and behavioral health facilities. The Center for Health Design, 2013.
. Integration of primary health services: Being put together does not mean they will work together. BMC Res Notes 2014;7:66.
. The impact of space and time on interprofessional teamwork in Canadian primary health care settings: implications for health care reform. Primary Health Care Research & Development 2009;10:151.
. Provider proximity as a predictor of referral rate and success. Psychol Serv 2013;10:395–400.
. Toward a theory of situation awareness in dynamic systems. Human factors. J Human Factors Ergonomics Soc 1995;37:32–64.
. Of other spaces. Diacritics 1986;16:22–7.
. Spatial formations. Thousand Oaks, CA: Sage, 1996.
. Social pressures in informal groups: A study of human factors in housing. Stanford University Press, 1950.
. Observation of interprofessional collaborative practice in primary care teams: An integrative literature review. International Journal of Nursing Studies. 2015;52:1217–30.
. Evaluative criteria for qualitative research in health care: Controversies and recommendations. Ann Fam Med 2008;6:331–9.
. Validity in qualitative research. Qual Health Res. 2001;11:522–37.